Can W2W Create the Shifts? Pay Rates – Who can see them? Prefs – Let Emps View Only? Shift notes just for Managers? EMPLOYEES – Let Them Sign In? Why Can’t I Sign In? Can I Get a Personal Demo? Who Picked up Shift First? Can I read employee messages? Differentiate types of Time Off? What Happens If My Account Expires? Why is Employee Over Max Hours? How far in advance can I schedule? What is a Group Administrator? How far back are schedules saved? What Happens When I Pay? How do I save my data? Managers can be signed in at once? Change Layout – Font, etc. Create same shifts every week? Limit to Number of Time Offs? Split Shifts – Multiple Shifts Per Day? Track Late, Absences, Called Out, etc. Unfilled open shifts on Tradeboard? How Do Employees Request Time Off? How to schedule monthly / biweeky? How Can a Manager Request Time Off? Max Hours / Shift Set Defaults? What do exports look like? Repeat shifts for # weeks? Add Multiple Employees To One Shift? Hide Days of the Week? Student class times not available? All employees see others’ phone? Why “Cannot Work” is Not Saving? Can I Resend a Notification? Can W2W Integrate With Others? What happens if delete employee? Why am I Seeing Last Month? – AutoFill by "Priority Group"
– Evenly Distribute "Special Shifts"
– Change Layout – Font, etc. All employees see others' phone? – Set up email "Reply To"
Why Can't I Sign In? Why "Cannot Work" is Not Saving? You can manually assign shifts at any time. If some of your employees always work certain shifts (“pinned” employees) you can assign only those employees and use Save Template (so that when you Import and AutoFill in future weeks, those employees will already be assigned). You can manually assign employees when Adding Shifts or later by Editing a Shift. 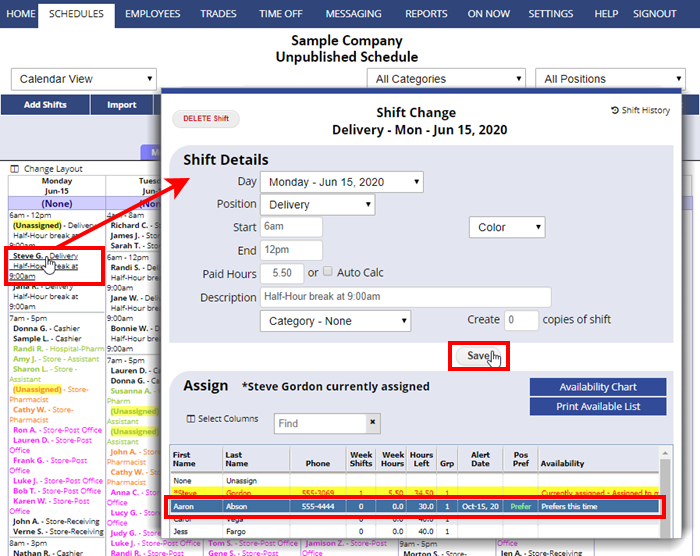 Note that the best way to assign shifts in our system is to use AutoFill or to create an unassgined shift and then click to edit it and you can see a list of available employees and which would be the best choice. 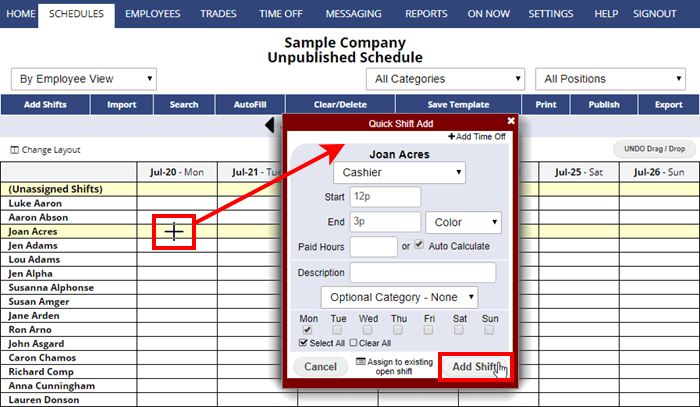 You can use the By Employee schedule view to quickly add a shift by clicking the cell for the employee/date. You also can assign an employee when you Add Shifts.